"Pless" redirects here. For the former principality or duchy, see Duchy of Pless. For the municipality in Bavaria, see Pleß. 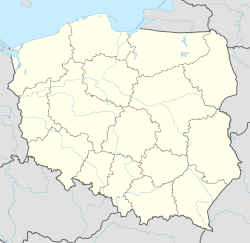 Pszczyna [ˈpʂt͡ʂɨna] (English: Pless, German: Pleß) is a town in southern Poland with 25,415 inhabitants (2010) within the immediate gmina. There are 33,654 inhabitants within the area of the town and 50,121 in Pszczyna County of which Pszczyna is the capital. The town is in the Silesian Voivodeship. It was a part of Katowice Voivodeship from 1975 until administrative reform in 1998. There are several different theories about the origins of the name "Pszczyna". Ezechiel Zivier (1868–1925) hypothesized that the land was first owned by Pleszko (alternatively Leszko, or possibly Leszek, Duke of Racibórz). Polish scholar Aleksander Brückner in turn, explained the name based on its old spelling Plszczyna, from the ancient Polish word pło or pleso meaning a lake or a place by the lake – thus suggesting that the name Plszczyna as well as its German equivalent Pleß had similar background. The version by Brückner, suggesting a lakeside rich with marshlands, based on a Proto-Slavic word plszczyna, is generally accepted in literature. Yet another version belongs to Prof. Jan Miodek from Wrocław University, who derived the name from the nearby Blszczyna river. The oldest settlement evolved around a small gord and wooden church in what was later known as Stara Wieś. The modern town (around Market Square) was probably founded in the second half of the 13th century. The first reference in sources to the place dates from 1303. The main trading route between Kievan Rus and the Moravian Gate ran through Pszczyna in the early Middle Ages, and the small settlement probably provided protective measures for merchants on the ford (surrounded by marshlands) of the small Pszczynka river. The land around Pszczyna was historically part of Lesser Poland. Casimir II the Just ceded the land to Mieszko Plątonogi, another Piast dynasty duke, from the Duchy of Opole and Racibórz, about 1177. Mieszko Plątonogi was succeeded by other dukes from the lineage of Opole-Racibor: Casimir I of Opole, Mieszko II, his brother Władysław Opolski, his two sons—Casimir of Bytom and Bolko I, and finally Leszek, who was the last to preserve the Duchy's independence. In 1327, he was forced to acknowledge sovereignty of John, King of Bohemia. After Leszek died childless in 1336, his lands passed down to his brother-in-law, Nicholas II, Duke of Opava (Mikołaj II), of the Czech royal family of Premyslid. Mikołaj II, his son John I, Duke of Opava-Ratibor, and his grandson John II, Duke of Opava-Ratibor (Jan II Żelazny) ruled the land for seven decades. In 1407, John II separated the area that is modern-day Pszczyna from his duchy as a wittum for his new wife, Helena of Lithuania (Helena Korybutówna, niece of Władysław II Jagiełło, the king of Poland). The boundaries outlined by John II survived well into the 20th century. The contemporary land of Pszczyna is only about half the size it was during the Middle Ages. In 1433, Pszczyna was attacked by the Hussites, who laid siege to the castle but were eventually repulsed. Helena outlived John II, and reigned until 1449. The land was inherited by her son, Nicholas V and then his widow, Barbara Rockenberg, the daughter of a wealthy merchant from Kraków. She was expelled by her stepson, John IV, who assumed power in the years 1462–1465. His rights were disputed, on the other side, by his brother, Wenceslaus III, Duke of Rybnik. Aggressive policies caused a conflict between Wenceslaus III and the King of Hungary, Maciej Korwin (Matthias Corvinus or Matthias I). Matthias overran the land and held the duke in captivity until his death. Casimir II, Duke of Cieszyn, the last of the Piast dynasty bloodline, bought the land in 1480, and in turn sold it to Hungarian magnate Aleksy Thurzo in 1517. Two years later, Luis II, King of Hungary, Bohemia and Croatia instituted the "Free State of Pszczyna", with its owner responsible not to him, but directly to the Emperor of the Holy Roman Empire. The new state was expanded to enclose fifty villages and four towns (including Bieruń, Mysłowice, and Mikołów), and was sworn allegiance by another 27 vassal villages. The Thurzo family were in close relations with Polish King Sigismund I the Old. Queen Bona Sforza stayed for a night on her way her the marriage in Kraków with Sigismund (1518). Thurzo's possessions were dissolved over time (stripped of Mysłowice in 1536) and eventually, the land of Pszczyna was purchased by Balthasar von Promnitz, bishop of Wrocław, under a special regulation that the land shall be further divided. Pszczyna was ravaged and pillaged during the Thirty Years' War. During the War of Austrian succession, The Kingdom of Prussia clashed with Habsburg Empire for Silesia and Frederick The Great, the king of Prussia, seized Silesia under the agreement of 1742. The town was pillaged again during the Seven Years' War. Shortly afterwards, the last Promnitz gave the land to his nephew, Frederic Erdmann. The next landowners of Erdmann's line, the Anhalts, had governed up to the half of the 19th century, when the rights changed again to the person of Hans Heinrich X from the powerful Hochberg family who held extensive lands around present-day Wałbrzych. The Hochbergs had reached a great prominence and wealth in the 19th century. From 1816 to 1922, the town was the seat of Kreis Pleß [de]. At the beginning of the 20th century, over 80 percent of population spoke Polish. When World War I erupted, the Hochbergs lent the estate to the German state for the military purpose. The German chief of staff held his headquarters in the castle of Pszczyna, that was often visited by Kaiser Wilhelm II himself. After the war ended, in the emerging conflict between the newly established Second Polish Republic and the Weimer Republic (Germany) struggled for control over the region. Prince Hans Heinrich XV (Polish: Jan Henryk XV) favored an independence movement for a Silesian Republic or at least Upper Silesia. The latter was supported by Związek Górnośląski (1919–1924) which was financed by him. With the outbreak of the Silesian Uprising, the Hochbergs sided firmly with the German cause and afforded the land to German paramilitary organizations, even for a prison for the Poles. Hans Heinrich XV himself supplied units at his own expense, commanded by his son, Hans Heinrich XVII in a bitter fight for Góra Świętej Anny. Earlier that year (1921) a plebiscite was held to determine the future of the region. In Pszczyna county 53 thousand voted for Poland and only 18 thousand for Germany. In contrast, voting solely in Pszczyna town gave victory to Germany. In the view of voting results and in consequence of the Third Silesian Uprising, the land of Pszczyna was granted to the Second Polish Republic. On May 29, 1922, the newly established Polish army in the west officially claimed the city for Poland. The first mayor of city became politician and diplomat Jan Figna. During the 1939 Defensive War, fighting occurred in the surroundings of Pszczyna, which can be seen by observing the leftovers of concrete strongholds around the town. In that area, the Battle of Pszczyna took place, where German forces breached main Polish defensive lines protecting the Silesian area. The Nazi Germans murdered 14 Poles suspected of spying on September 14, and they were buried in the nearby forest in an unmarked mass grave. Between the end of January and beginning of February 1945, the war storm came through Pszczyna with no serious damage to the city. Unfortunately, the wooden historic church of Saint Jadwiga burned down in 1939. In January 1945, Nazis evacuated prisoners of Auschwitz-Birkenau concentration camp. During this evacuation, many inhabitants were killed, some even in the streets. The city was liberated on February 10, 1945. Unlike the rest of Upper Silesia, Pszczyna never experienced rapid industrialization. The ELWO factory was expanded and a new creamery and mill were founded. This, however, helped to preserve the historic old town and the palace located in the city center. In 2010 Pszczyna had a population of 25,415. The Jewish community was small before the edict of 1780 granting Jews the right to settle in Silesian towns to the east of river Oder. By 1787, the Jewish population had grown to 85 people. Regulations passed by Frederick William III in 1812 proclaimed Jews to be full citizens of the state. As their numbers grew, Jews called for a synagogue to perform their religious duties. A wooden synagogue was built in 1834 and, eventually, a bricked structure in 1852. The synagogue has survived into the 21st century but, of the interior nothing of historical value remains: during World War II it was used as a cinema. The community's educational needs were also met with the establishment of a cheder (Jewish school) in 1812. From 1820, Jews were allowed to attend Protestant and Catholic schools. A new, joint Protestant and Jewish school was established in 1873 and became a municipal school in 1893. The Jewish community reached its highest peak in 1885, numbering 341 members. Markus Brann, Jewish theologian and historian and future lecturer at the Jewish Theological Seminary of Breslau, was active in Pszczyna during that period. The number of Jews had dropped significantly when Poland took control of the city in 1922, as most of the Jews identifying themselves as Germans had left for Germany. Only scarce evidence of the town's former Jewish presence has been left – the cemetery, the former residence of the Jewish community and the synagogue. The cemetery in Pszczyna,on Katowicka Street, was founded in 1814. The last reported burial took place in 1937. During World War II the cemetery was not destroyed. The oldest tombstone was discovered in June 2009. It belongs to Gitel Gutmann, who died on September 10, 1814. The cemetery is in the permanent custody of Sławomir Pastuszka, who provides information both on the cemetery and on the local Jewish community. On May 8, 2012 it was reported that the Jewish cemetery had been vandalized. Nineteen tombstones, some of which date back to the early 19th century, were damaged in the old part of the cemetery. The local community contributed to the restoration of 150 graves of historical value. Lutheranism was introduced to Pszczyna in 1568 by Duke Karol Promnitz. In a course of next 20 years, Lutheranism spread among the local population. A Protestant minister came to the county in 1569, followed by opening of the first Protestant school. During the counter-reformation in 1649 celebrations of Protestant religious service were confined to the Castle of Pszczyna. From 1709 on Erdmann Promnitz received permission for building a Protestant church. Along with church, a Protestant school had been reintroduced. The church burned down in 1905 and was rebuilt two years later. It is still in operation and serves as the central point for the Protestant community, which numbers 1500 members. Pszczyna is situated on sandy plains ascending into the east. The land is slightly hilly, but with no large relative elevations. The highest points are less than 260 metres (850 feet) above sea level. As Pszczyna is in a moderate climatic zone, the climate is directly influenced by a clash of oceanic and continental air masses. While the former usually takes the upper hand, the temperature does not vary widely. Severe or long winters are rare. The warm tropical air coming through the Moravian Gate (a depression between the Sudetes and Carpathian mountains) contributes to this. The average annual temperature is 7–8 °C (45–46 °F). The hottest month is July (15 °C (59 °F) average) and the coldest is January (−1 °C (30 °F) average). R. Gumiński researched the climate in the land around Pszczyna. He defined three distinguished sub-climatic provinces – the western "podsudecka", the eastern "tarnowska", and the northern "kielecko-czestochowska". The eastern part offers the most favorable environment for plants and vegetation, with over 220 days of growing season and 770 mm (30 in) of precipitation. Pszczyna gets the least rainfall in winter months and the highest level in July. Snowfall begins in the middle of November, lingers for 50–70 days, and generally does not exceed a depth of 15 cm (5.9 in). Slight westerly winds are dominant, averaging 2–3 km/h (1.2–1.9 mph). The period of windless weather appears regularly, caused by the cover of, and the dry down-slope foehn winds arriving from, the Beskid Śląski mountain range. Goczałkowice Reservoir, by far the largest reservoir in southern Poland, gives the climate in Pszczyna an even more distinctive imprint by moderating winters and summers. The total area of 174 square kilometres (67 sq mi) includes 95 km2 (37 sq mi) of farmland (68 km2 (26 sq mi) of arable land, 1.5 km2 (0.58 sq mi) of orchards, 16 km2 (6.2 sq mi) of meadows, 9 km2 (3.5 sq mi) of pasture) and 51 km2 (20 sq mi) of forest grounds (50 km2 (19 sq mi) of forests, 1.6 km2 (0.62 sq mi) of tree-planted and shrub-planted land). Alicja Janosz (born 1985), the winner of the 2002 Polish Idol contest, was born in Pszczyna. (in Polish) Name of town derived from the word "plszczyna", describing the area. ^ Orlik, Zygmunt J. (2000). Szkice z dziejów Starej Wsi. Pszczyna: ITKM. pp. 15–16. ISBN 83-7216-174-7. ^ "The Jewish cemetery in Pszczyna (Katowicka Street)". Virtula Stetl. POLIN Museum of the History of Polish Jews. Retrieved 9 January 2019. ^ "A DEFACED JEWISH CEMETERY IN PSZCZYNA". Museum of the History of Polish Jews. Retrieved 31 July 2012. ^ "Pszczyna in figures". 2003. Archived from the original on 14 April 2012. Retrieved 6 May 2012. Wikimedia Commons has media related to Pszczyna. This page was last edited on 29 March 2019, at 09:09 (UTC).